Jennifer Glassman, Todd Adams, Ted Johnson, Nicole Lamb and Gisella Falossi of UC San Diego's Procurements and Contracts department. UC San Diego received the Award for Excellence in Procurement at the National Association of Educational Procurement (NAEP) 2011 Annual Recognition Awards ceremony during its recent annual meeting last week in Memphis, Tenn. NAEP is the national association representing the procurement profession; its membership is restricted to purchasing staff in colleges, research institutions, hospitals and K-12 schools. The Award for Excellence in Procurement is given each year to an educational institution that has shown a vision and successful execution for a key strategic initiative in the area of procurement best practices. UC San Diego’s Todd Adams, senior manager, central procurement, and Nicole Lamb, senior manager, strategic sourcing, accepted the award on behalf of the university’s Procurement and Contracts department. 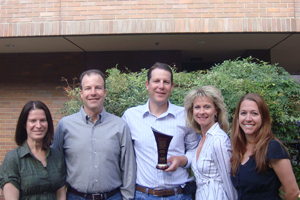 The UC San Diego team received the honor for its leadership role in collaborating with SciQuest, a web-based portal and hosted buying service that serves as the platform for the campus eProcurement tool, Marketplace; the University of California Office of the President; and individual UC campuses to form a UC-system-wide consortium for cost and time efficiencies. The idea behind this initiative was to leverage a common system infrastructure by joining the five SciQuest-platform campuses – UC Berkeley, UC Riverside, UC San Francisco and UC Santa Cruz, in addition to UC San Diego – under a single contract administration tool, as well as provide a single repository and access point for system-wide contracted pricing. The results of the consortium have been successful on multiple fronts, foremost the transfer of UC-contracted spend analysis from individual campus resources to the Office of the President, and secondly, a consolidated and unified approach in managing supplier relationships. The UC consortium is now providing real-time automated spend data to UCOP (when it used to take several weeks to manually compile), thus increasing their visibility, oversight and influence over strategically sourced contracts. Tasks such as price file analysis, which required a separate and duplicative process by each campus, can now be conducted at UCOP on behalf of consortium members, eliminating redundancies across the board. These new eProcurement tools offer an additional strategic sourcing efficiency for each campus and the UC system. From a budget side, immediate access to relevant spend data among all the campuses is leading to more effective contract negotiation, with the enhanced data analysis functions identifying more cost savings opportunities at a faster rate. UC San Diego’s Marketplace, powered by the SciQuest portal, has resulted in $2.2 million in hard savings to the university, plus additional process efficiency savings due to electronic order and invoice features. Just under 8,000 users access the Marketplace tool on campus, averaging 3,500 unique users each month, with an average of 900 purchase orders placed through the site on a daily basis.